TUTTLE Foundry An excerpt from the book "Butte & Anaconda Revisited" by Brian Shovers, Mark Fiege, Dale Martin and Fred Quivik. Development of foundries in Montana, as with other manufacturing enterprises, was directly associated with large-scale mining and ore refining. At first, most of the equipment needed by the industry was transported by railroad from outside the region. However, local foundry works soon emerged to provide mining and milling companies with a quicker and cheaper alternative to distant manufacturers. In 1894, reports from the Montana Bureau of Agriculture, Labor and Industry show that there ere eight foundries and associated machine shops in Montana; two years later, there were eleven. In 1897, the number fell to eight, but by 1898 it had risen back to ten. The 1898 report stated that the manufacture of castings and machinery for mines constituted the larger part of foundry work, although most of the work was not done for the larger mines, which had their own machine shops. During the five years covered by the reports, the number of men employed in the foundry industry only once rose above 500, in 1896. The foundry business was a small but important part of Montana industry. For all of its mineral wealth, Montana never produced significant amounts of iron ore; therefore, all iron and steel fabricating relied on sources from outside the State. Montana's 19th century foundries were concentrated in established industrial centers, such as Helena, Great Falls, and Butte. As early as 1886, the Helena Iron Works manufactured steam engines and farm implements, in addition to mining equipment. By 1896, Great Falls had at least one foundry/machine shop firm, the Great Falls Iron Works. During the 1880s and 1890s, Butte had several foundries, including the Lexington, Butte Foundry and Machine Shop, and the Montana Iron Works. 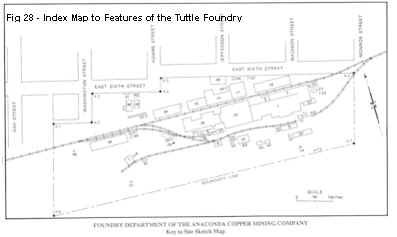 One of the early foundries in Butte was Tuttle and Company, which was founded in 1881. In 1890, Western Iron Works was incorporated, with a new foundry near the Parrot smelter on the southeast edge of the city. All of these firms specialized in the manufacture of castings and machinery for mines and smelters. Montana Iron Works became particularly well-known for its manufacture of a mine timber framing machine. By 1890, Montana was producing 50 percent of all copper mined in the United States, and had overtaken Michigan as the nation's leading source of the metal. ACM (Anaconda Mining Company) had now grown into one of the great foundations of the copper industry. Marcus Daly, superintendent and mastermind of the company, oversaw the operation of a vast industrial complex, comprised of numerous mines on the Butte hill and the smelters in Anaconda. At the same time, these smelters made up the largest non-ferrous metallurgical plant in the world. In the interest of economy and efficient operation, Daly recognized the logic in controlling all aspects of copper production, including auxiliary industries. By the mid-1890s, ACM owned such subsidiaries and departments as an ore-hauling railway, an electrical power and street railway company, and a brick factory. Daly also realized the need for another component to his system - a foundry and machine shop plant. Several factors probably encouraged construction of a foundry. In 1889, ACM completed a new addition to its smelter facilities, called the Lower Works. The sheer size of ACM's operations created a demand for foundry and machine shop products that local independent manufacturers could not meet. Products from distant foundries cost more than those produced locally, and long-distance railroad transportation inhibited fast delivery of essential parts. Exactly when Daly made the decision to build a foundry is unclear, but some time before 1890, he had joined forces with an industrial contractor named Shelley Tuttle and began planning for the new factory. They chose a 30-acre tract on the southeast edge of Anaconda, abutting the foothills of nearby Mt. Haggin. During early September of 1889, workmen started excavating for the foundations of various foundry buildings. On December 12, the Anaconda Weekly Review reported that the machine shops at the Upper and Lower Works and at Carroll would soon be moved to the foundry. The whole factory was probably in place by the end of January. When completed, the complex included a foundry, machine shop, boiler and blacksmith shop, pattern shop, wareho use and storage facilities, and an office (Fig. 26). All of the new structures were built with brick walls, no doubt an attempt to reduce the danger of fire. The new wooden buildings of the Lower Works had burned upon completion in March 1889; ACM immediately rebuilt them of steel columns and corrugated metal, at great expense. The lesson of the great conflagration was applied elsewhere. Almost all subsequent buildings, including some at the foundry, were designed to resist fire. On January 27, 1890, Tuttle, Daly, and Dennis F. Hallahan, one of Daly's business associates, incorporated the foundry as The Tuttle Manufacturing and Supply Company. The capital stock of the firm was set at $100,000. 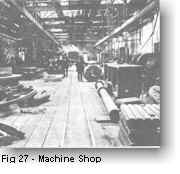 In addition to running a foundry, the men laid out as official objectives the operation of a machine and boiler works and the sale of hardware, mining supplies and machinery. Although the business carried Tuttle's name, Daly had controlling interest, insuring that the foundry would operate more or less as a subsidiary of ACM. Another manufactory subordinate, the Standard Fire Brick Company, was also incorporated in 1890. By the end of 1890, the Tuttle Manufacturing and Supply Company was in full production. A staff of molders, pattern makers, machinists and blacksmiths operated the plant and began turning out all manner of foundry products. The company soon opened an office and warehouse at the smelter site, between the Upper and Lower Works. As the Reduction Works underwent technological improvements and expansions, the Tuttle Company manufactured a multitude of metal objects required to maintain operations. This included all types of machinery replacement parts (especially for devices such as ore concentrating mills and roasting and smelting furnaces), mill balls, car wheels, gears and sheave wheels (Fig. 27). Besides iron, the foundry also made castings of brass (pipe and pum p parts), and fabricated some items from bar and sheet steel (boilers, trusses, girders) shipped to the foundry by railroad. As ACM's mills and smelters grew, so did the foundry, increasing in size and capacity to meet the demand for larger and more complex metal products. True to its stated purpose, the Tuttle Company expanded into general sales of hardware, machines, and mining supplies. On August 11, 1890, Shelley Tuttle purchased the stock of goods and merchandise of the Butte Trading Company for $47,000. By 1891, the Tuttle Company operated hardware stores in Butte and Missoula. The firm eventually advertised the sale of heavy mining machinery, such as Ingersoll Sargeant rock drills, and Knowles and Cameron steam pumps, as well as domestic items, including Garland stoves and ranges and all types of home furnishing goods. Sales for 1890 totaled $760,000. In time, the company began serving customers throughout the northern Rocky Mountain region. By the close of 1894, the Tuttle foundry works employed 175 men, including 60 in the molding department, 45 in the machine shop, 22 in the boiler shop, 20 in the blacksmith shop, 12 in the pattern shop, 20 general laborers, and assorted clerks and foremen. 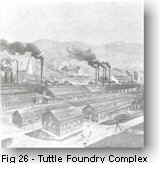 In terms of numbers of workers, the Tuttle foundry was the largest in Montana. Furthermore, during 1894, the foundry manufactured a monthly average of 250 tons of castings, and the boiler shop fabricated 30 carloads of sheet steel into useful products. The foundry contributed to the prosperity of the town of Anaconda and became a source of civic pride while local politicians competed with Helena for the privilege of becoming the State capital. The Anaconda Standard boasted ... the Tuttle Company had no superior in the West in terms of facility for quick work and for meeting every demand made upon it for repairs to mining or smelting machinery. In early 1896, Shelley Tuttle sold his share of the foundry, and the Tuttle Company underwent a reorganization. Michael Donahoe and J.A. Dunlap, both Daly associates, joined the board of trustees. Stock was reapportioned so that Daly held nearly every share. On May 27, 1896, the men voted to transfer the ownership of the Tuttle Manufacturing and Supply Company to the Anaconda Copper Mining Company for the sum of one dollar. During 1896, Anaconda absorbed several other incorporated companies which had always performed functions essential to Daly's copper production system: Anaconda Water Company, Anaconda Townsite Company, Electric Light and Power, Street Railway Company, Standard Fire Brick Company, and the Montana Hotel Association. Also in the ACM portfolio were coal mines, coke-making facilities and stores at Belt, sawmills and stores in Hamilton, as well as the Butte, Anaconda and Pacific Railway which hauled ore from Butte to Anaconda. According to a 1896 ACM board of trustees report, ACM had invested $4,755,399 in its various subordinate industries. The report expressed confidence in the years ahead, stating that ... now the capacity of these several plants is believed to be equal to any future requirements. More importantly, ACM received reduced prices on goods and services from its subsidiary departments and avoided the problems of having to deal with sovereign firms. In discussing the company's late 19th century stature, historian Michael Malone called ACM ... one of the great American corporations independent, beautifully integrated, conservatively capitalized, and astutely managed. After becoming a department of ACM, the foundry expanded its productive capacity. By 1896, over 300 men worked at the plant. Four years later, the number had risen to a workforce of nearly 450. That same year (according to the Anaconda Standard), the foundry made 25 tons of castings daily and over 600 tons each month, a substantial increase since 1894. Some of the equipment manufactured at the Foundry Department was of substantial size. For example, Engineering and Mining Journal reported on December 19, 1896, that the foundry was in the process of fabricating nine-ton skips (ore containers) to accompany a mammoth hoisting engine (called the "Aztec") at the Mountain Consolidated mine in Butte. ACM also began advertising parts and equipment for sale to regional mining and milling companies in an attempt to compete against eastern manufacturers. In 1896, the Foundry Department distributed its first (and apparently only) catalog. The glossy 262-page publication noted ... that the association of the foundry to the great mines in Butte and the famous smelters in Anaconda endowed the factory with the experience needed to produce superior wares. The catalog directed the attention of mining men and engineers to the ability of the department to fill all orders for general mining machinery, which they had been in the habit of placing in eastern cities. This competitiveness with eastern manufacturers was echoed in subsequent advertising. Among the more notable ACM-made products listed in the catalog was a patented, self-oiling mine car axle (more than 3,000 sets were sold within two years), a variety of mine cars, boilers, hoists, concentrators, furnaces and ore stamp batteries. And, as the catalog made clear, the Foundry Department was prepared to furnish the machinery for any size mill, or contract for the erection of same, complete, and in running order on the ground. In addition to its own manufactures, ACM sold such well- known machines and equipment as Buffalo blowers, Roebling's wire rope, Corliss engines, Pelton water wheels and Fairbanks scales. Furthermore, the Foundry Department fabricated machinery and equipment not included in the catalog. Sometime near the turn of the century, the plant branched out into production of implements for gold dredging. Workmen built and repaired gold dredging machinery for companies in Montana, Idaho, Wyoming, British Columbia and Utah. The foundry also cast a variety of architectural members and ornaments, such as store fronts and lampposts, some of which still adorn buildings and streets in the city of Anaconda. Aside from boilers, the foundry also made the plant's most spectacular products. With the aid of a hydraulic riveting machine, workmen put together girders and smokestacks. According to an article in the Anaconda Standard in 1900, boilermen had built and erected the highest self-supporting steel stacks in Butte. The boiler shop also made ore bins for the mines in Butte, and although there is no direct evidence showing a connection between the boiler shop and the famous mine headframes, the shop obviously had the capability to manufacture them. In fact, a measured drawing that was later discovered in the Foundry Department office depicts a large steel headframe similar to those in Butte. Throughout its history and up until its closure in 1980, the foundry operated as an integral part of ACM's gigantic industrial system, fulfilling the needs of mines and smelters as well as those of independent businesses. It served as one of the largest and most important subordinate operations, at least in terms of machines, equipment and manufacturing. The Foundry Department of the Anaconda Copper Mining Company continued its normal operations until the 1960s, when copper production in the area began to abate. In 1980, ARCO shut down the Washoe smelter and all subsidiary departments due to world copper market conditions. Soon after, three private investors, including two former ACM engineers, bought the foundry and returned it to production. As AFFCO, Inc., the business fills orders for mining firms throughout the state, such as the Golden Sunlight mine near Whitehall. The AFFCO complex has changed little over the past 65 years, although most of the foundry operations have been updated. The plant remains the oldest, largest, and most intact foundry works in all of Montana. Facilities and processes - The physical arrangement of the buildings at AFFCO clearly represent the processes undertaken at the foundry and the movement of materials within the complex (Fig 28). At the east end of the complex is the main foundry building, served by a railroad spur which connects to the mainline of the Rarus Railroad (formerly the Butte, Anaconda & Pacific). Materials, such as iron for casting are delivered to this area. The gin pole in the yard and the overhead traveling crane in the foundry building is used for unloading. Northwest of the foundry building, facing the street, is the main office. Employees and visitors pass through the main gate due north of the office. An employee change house is located next to the gate and northeast of the office. At the rear of the office are several connecting buildings: the pattern shop at the east end, a small machine shop next to the office, and the bar iron storage building to the west. This configuration corresponds to the operation of the facility. The pattern shop, where carpenters construct the patterns for castings, is close to the foundry where the casting takes place; the small machine shop is close to the main machine shop, which is due west of the foundry and due south of the office and small machine shop; and the bar storage building is adjacent to the other shops where stored materials are needed. The large pattern storage building is north of the foundry and east of the pattern shop for easy access by workers at both locations. Materials are delivered to the east end of the foundry; castings are moved out of the foundry to the west and into adjoining shops for further finishing and fabricating. Connected to the west end of the foundry building is the main machine shop. The boiler shop is connected to the west end of the machine shop. Between these shops and the office group of buildings, a set of railroad tracks passed to the west end of the complex, where they switch-backed and climbed the hill south of the foundry shops so that materials could be delivered to upper levels. North of the tracks and boiler shop, and west of the bar iron storage building, is the blacksmith shop. Other free-standing buildings surround the main cluster of shops, storage facilities and an office. Each of the surrounding buildings is located in a manner which facilitates the overall operation of the complex. North of the blacksmith shop are several garages and a barn, which survive from the period when horses provided an important mode of transportation. West of the complex is an additional storage area, in which the oil house, hardware warehouse, and the foundation of the sheet-metal warehouse are located. The gin pole in this area was used for moving large objects to and from railroad cars. The iron breaker and the boiler house are the major buildings on the hill south of the complex, and they are accompanied by sheds, bins, and shacks for the storage of tools, lumber, sand, coal, coke and scrap. The sand storage area is located near the foundry for easy access in the making of molds. Scrap storage is located near the iron breaker, which in turn, is located near both the foundry and the machine shop, where quantities of scrap are both used and generated. AFFCO has updated many of the operations at the foundry. The two large cupola furnaces no longer are used to melt iron. The company has installed new electric furnaces, which do not violate air quality standards and which allow casting of various steel alloys. Steel flasks are used instead of wood, and a mechanical sand conveyor and pneumatic tampers have been introduced for use in making molds. These changes allow AFFCO to run a much more efficient operation and to offer its customers a broader selection of steel castings. Despite these changes, the main buildings in the complex are used much with the same manner since the beginning of the century. Anaconda Copper Mining Company (n.d.),Re- Port of Manufacturing Conditions at the Anaconda Copper Mining Company Foundry Department, Anaconda, Montana. Anaconda Company Records, Box 172, Folder G.123: Montana Historical Society Ar- chives, Helena. Anaconda Copper Mining Company Foundry Department, 1896, Catalog no. 1: Anaconda Publishing Company, Anaconda, 262 P..
Montana Department of Agriculture, Labor, and Industry, Reports for the years ending November 30, 1893, 1894, 1895, 1896, 1897, 1898, Helena. Stanley, F.A., 1913, A Large Montana Mining Machine Shop, in American Machinist, p. 253-259. Tuttle Manufacturing and Supply Company, 1896, Minute Book: Anaconda Copper Mining Company Records, Box 257, Folder 3: Montana Historical Society Archives, Helena.